Lorrie's Story: Cricut Explore Vs Silhouette Cameo - Finally, a Factual Independent Study - THE RESULTS ARE IN! 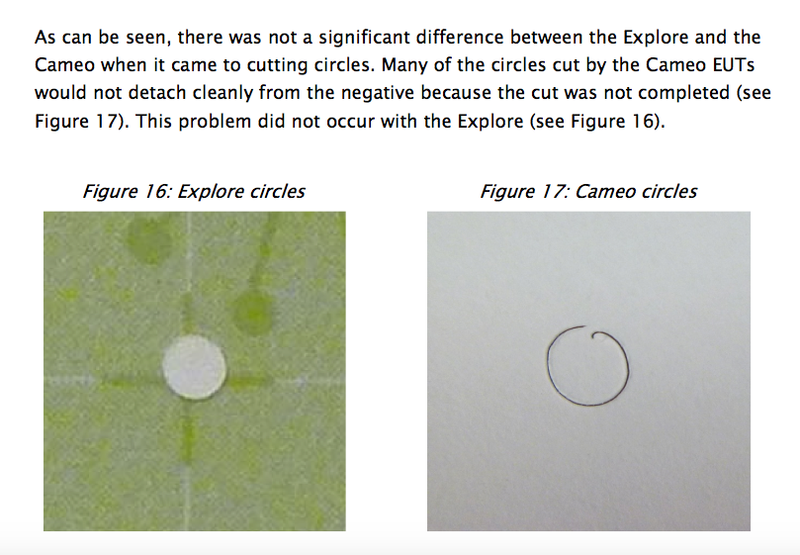 Cricut Explore Vs Silhouette Cameo - Finally, a Factual Independent Study - THE RESULTS ARE IN! The Cameo failed on 7 out of the 8 materials we tested: Foam, Leather (soft), Leather (hard), Chipboard, Chipboard (dense), Magnet sheet, and Aluminum. Explore cut all 8 materials nearly 100% of the time. We had designed more force in Explore so we are not surprised. Explore circles are really circles, but the Silhouette machine had repeated issues of not starting and stopping their circles in the same place. While the circles were coming out round, they just weren’t complete. · Explore cuts truer to the design than the Cameo. Essentially, if you have a design, Design Space & Explore follow the actual design more accurately than the Cameo. This is exciting news and factual information. No need to take my word for it, read the report. Quite clearly the Explore out performs the Silhouette Cameo.